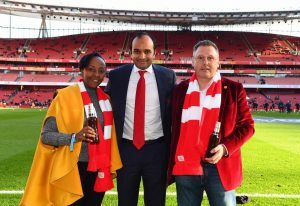 SKOL Brewery Ltd (SBL) has announced that the recent regional partnership it signed with Arsenal is beneficial for both the brewery and the English Premier League football club. 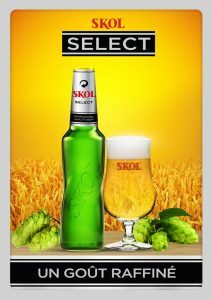 The partnership will start with activities in Rwanda and the brewery’s recently launched a new brand, SKOL SELECT as the partner beer with Arsenal. Speaking to the press yesterday during a conference, Ivan Wulffaert – General Manager, SKOL Brewery Limited Rwanda said that they plan to use both advertisement and a range of promotional activities initially in Rwanda, to grow support for both the SBL and Arsenal brands. “Arsenal has similar values as our company. Football and beer often go hand in hand. They go together as they are all about fun and togetherness. 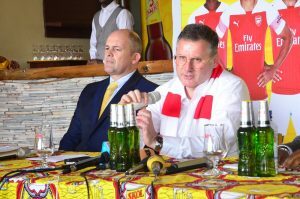 The deal will be key to use both advertisement and a range of promotional activities initially in Rwanda, to grow support for both Skol and Arsenal brands,” Wulffaert told the media this week. “The main reason why we are partnering with Arsenal is not for shirt or stadium visibility but because we want to be a link between what is happening here in Rwanda and a number of other countries in Africa as well as the club. We are going for a type of ownership where we will interact with the supporters and footballers here in the region,” he added. Arsenal is the third most supported English football team in Africa, recording over 88 million supporters in Sub-Sahara region alone. The club already has a presence in Rwanda with their partnership with RDB and SKOL will be looking forward to further help grow its fan base. This year Skol will give consumers and fans a chance to win prizes, including tickets to watch Arsenal matches at Emirates Stadium as well as official Arsenal merchandise such as signed shirts and footballs. In addition to consumer activities, SKOL Brewery will also provide the opportunity for selected Skol-sponsored African football teams with once in a lifetime trips to London to visit Emirates Stadium and receive coaching sessions with Arsenal coaches. SKOL has for long been involved in football, with Rayon Sports, a local football club. Through the deal with Arsenal, the firm is keen on developing the management of football clubs in Rwanda, by organizing an official coaching clinic and football consultancy in Rwanda. “We would like to see Rwandan footballers develop, we would like the game of Rayon Sports to develop. And, through our deal, Arsenal will send coaches to Rwanda and give training sessions to Rayon Sports, help to detect and develop talents besides sending a team to play Arsenal once every season,” he said. The deal stipulates that Arsenal management staff will coach the management staff of football clubs in Rwanda, with Rayon Sports the main beneficiary whereby the staff and management of Rayon Sports can learn from Arsenal. Some skills will include how to maintain a football pitch, how to financially run a football club, establish a contractual relationship with a football player, and how to develop a ticketing system, among others.